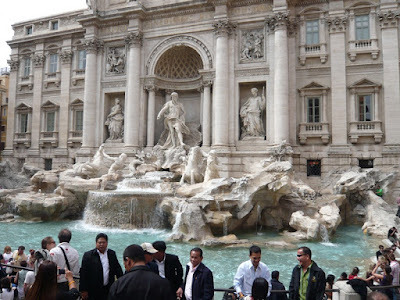 The Trevi Fountain is the largest Baroque fountain in the city of Rome. 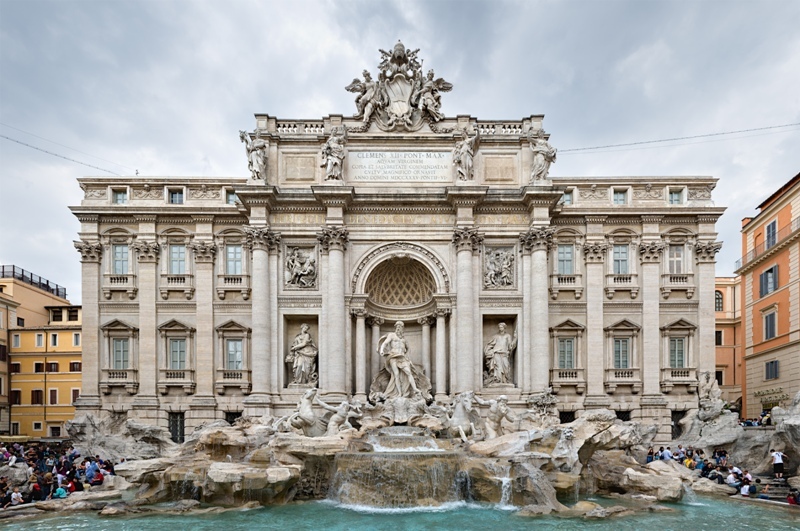 In a city brimming with architectural wonders, the Trevi Fountain stands out. As massive as the fountain is, the piazza where it's located is relatively small. So small that it's nearly impossible to photograph the entire fountain without a super wide angle lens. My regular wide angle could only capture this much of it as I was standing in front of it. This shot is from Wikimedia Commons and it's been electronically manipulated to remove the distortion. It's the clearest shot of the fountain I've ever seen. Though you can definitely see the whole thing, photographing it is another matter all together. It's 85 feet high and 65 feet wide and by any measure, that's a big fountain. 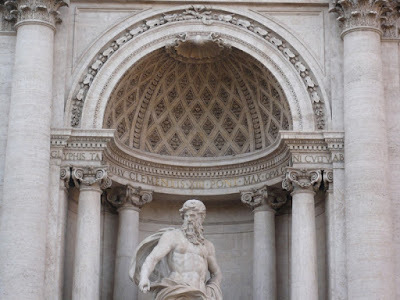 Like everything in Rome, the Trevi Fountain has a story behind it that weaves together threads of Ancient Roman history, the Papacy and Roman identity. There's absolutely nothing subtle about the fountain itself or the story of how it came to be. In 19 B.C., Roman engineers finished the Aqua Virgo, one of the aqueducts that made life in Ancient Rome possible. 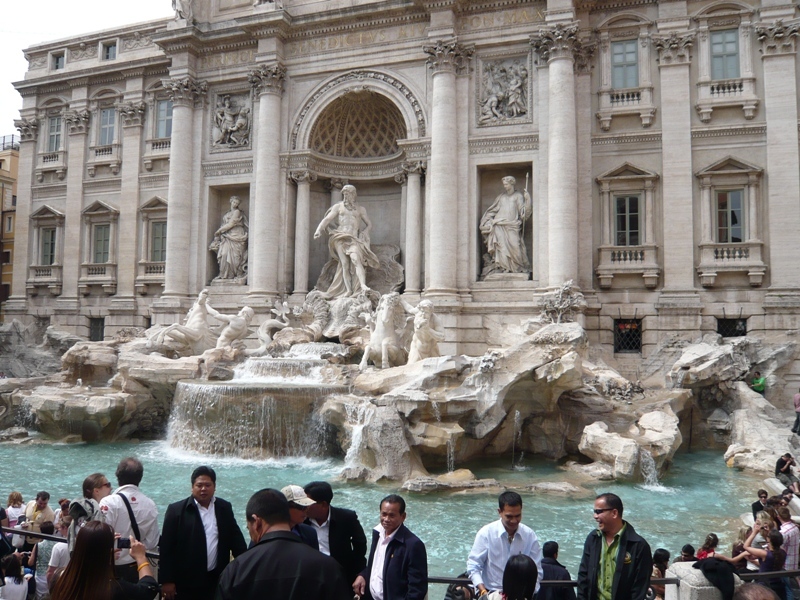 The Aqua Virgo terminated where the Trevi Fountain stands now and it supplied Rome with fresh water for 400 years. During the sieges of the Goths in the 500s, the Goths drove Rome to its knees and delivered a death blow when they broke all of the aqueducts in Rome. Fast forward to the 1450s when Pope Nicholas V repaired the Aqua Virgo (now called the Acqua Vergine) and commissioned a fountain. The original fountain was a pretty basic affair, little more than a basin that collected the water from the aqueduct. 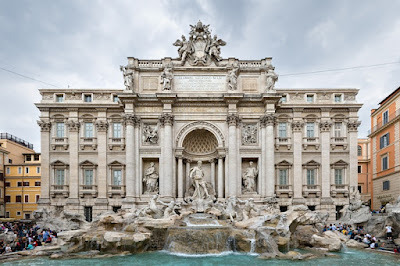 In 1629, Pope Urban VIII found the fountain to be too plain and commissioned no less than Gian Lorenzo Bernini to draw up a new fountain. The pope died before construction could start and the project died with Pope Urban VIII. In 1730, Pope Clement XII held a contest to see who could design a fountain grand enough to mark the triumph of the repaired aqueduct. Clement XII was a Florentine and he chose the Florentine architect Alessandro Galilei's design over the Roman architect Nicola Salvi. The outcry from the streets of Rome was as instant as it was intense. No Florentine was going to build anything in Rome in the 1700s, thank you very much. Bowing to public pressure, Clement XII awarded the commission to Salvi and the fountain you can see today looks exactly like it did when Salvi designed it. Knock offs of it at Epcot Center and Caesar's Palace in Las Vegas do it a supreme disservice. The original is a glorious pile of travertine, one well worth the effort it takes to stand in front of. When I heard that Top Knobs had released a new series of cabinet knobs and pulls that paid homage to the Trevi Fountain I was suspicious. Once I saw them I dropped my suspicions immediately. Top Knobs Passport series manages to invoke the details of the fountain without going overboard. As soon as I saw that cup pull I went back through my photos of the Trevi Fountain and found this detail shot I took in Rome. 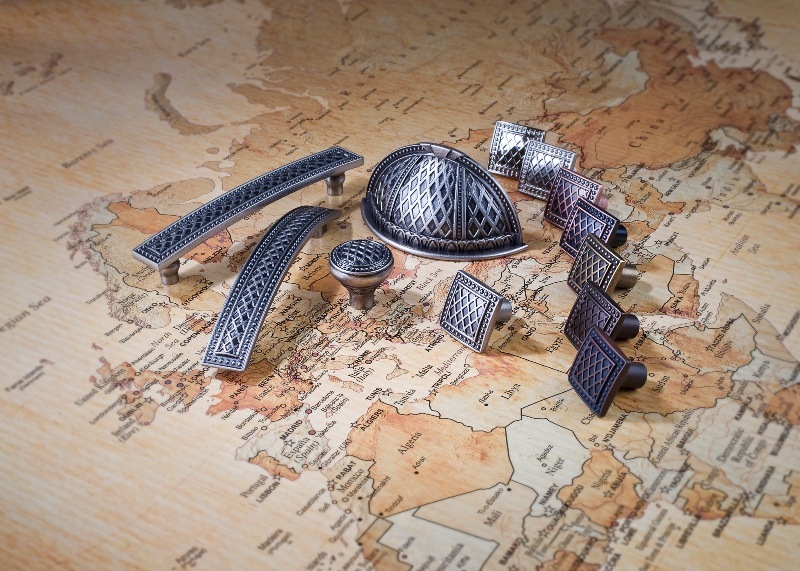 The Trevi Fountain-inspired hardware is but a part of the entire Passport series from Top Knobs. Other collections in the Passport series pay tribute to such iconic locations the Great Wall of China, the Sydney Opera House, the Tower Bridge in London, the ancient temple complex at Luxor and Victoria Falls. I haven't seen any of the rest of collections, but they'll be debuting at KBIS in a few weeks. You can find the rest of Top Knobs' extensive offerings on their website. This post encapsulates everything I love about this blog and why I always look in. And thank you Susan! You really made my day. There are times when I worry that I go too far afield with this stuff and your feedback is good to hear. Love it! The cup pull is also one of my favs. Can't wait to present the collection at KBIS. I can't wait to see what they're done with Victoria Falls! Well, there you go again! I have been thinking about another blog on Top Knobs, something memorable, something that would just get people on the edge of their seats saying something like, "Wow, this guy can really write!" And then you come along with a blog that kicks the bejabbers out anything I might have come up. Seriously, my man, it is most definitely one of your better efforts. What a fun post! Travel, history, culture and hardware all tied into one. I had no idea the Trevi Fountain was so big. And, I agree that is simply stunning hardware. You need to go to Rome! 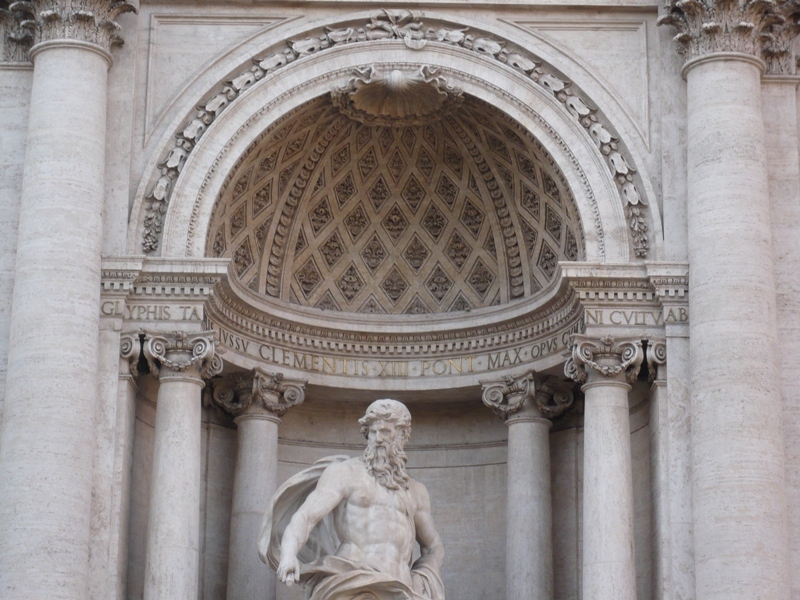 The Trevi is built into the facade of the building behind it and they're all the same sculpture. Talk about an adaptive use of a space!